The information technology (IT) sector experienced increased volatility over the quarter. An increase in regulatory scrutiny, concerns about data and user-privacy practices in social media companies and trade worries provided investors with reasons to realize gains. Taking a longer-term view, however, we believe that fundamentals generally remain sound. The IT sector in emerging markets continues to provide many interesting opportunities, from hardware and software to various forms of e-commerce and entertainment. The key is to evaluate the sustainability of companies’ earnings and valuations relative to their history as well as peers. We are also monitoring plans to introduce China depositary receipts of offshore-listed companies, as this could be a positive catalyst for US- and Hong Kong-listed Chinese IT companies. North Korean leader Kim Jong Un visited China in late March to meet President Xi Jinping. Kim’s commitment to denuclearization indicates movement in the right direction. While it is too early to draw any conclusions, geopolitical risk in the region has eased recently. Any concrete steps could bode well for the Korean peninsula and may result in increased economic activity between the South and North, which could benefit South Korean companies. Agreement on a revised US–South Korea trade agreement also eased trade concerns. South Korea has a powerful export sector encompassing a range of products—shipbuilding, construction, car making, consumer electronics and advanced technology, among others—with globally competitive levels of expertise in many fields. A sophisticated domestic consumer economy along with increasing penetration of South Korean brands into other Asian markets also bode well for South Korean companies. Importantly, emerging-market economies look poised for further growth. 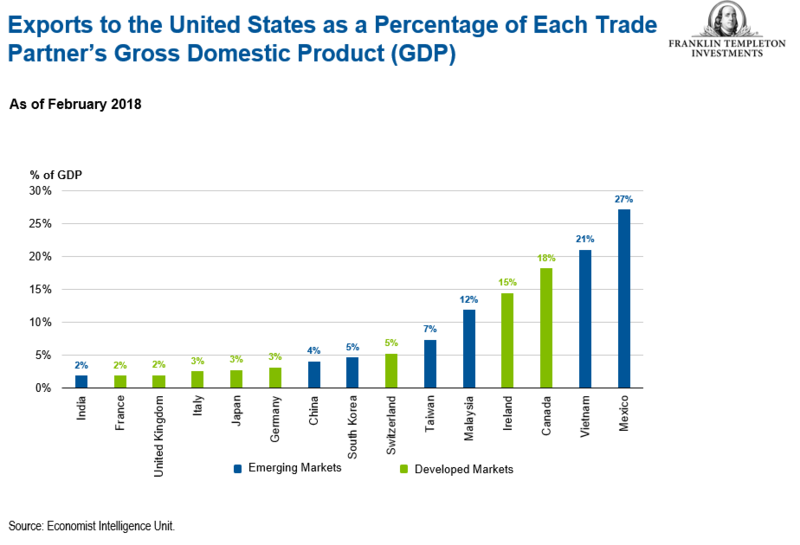 The International Monetary Fund estimates 4.9% GDP growth for emerging markets in 2018, up from 4.7% in 2017.1 While protectionist trade actions taken by the United States have cast a shadow over the synchronized global growth that has lifted stock markets, the long-term outcome remains to be seen. The scope and strength of international trade flows should not be underestimated, as evident by the historical growth in intra-Asia trade. We believe that the key drivers for emerging markets—IT and consumerism—remain intact. EM companies have not only embraced the use of technology but have also become global innovators in many areas, ranging from e-commerce to mobile banking, robotics, autonomous vehicles and more. Rising wealth in emerging markets is another secular driver. We expect demand for goods and services to continue growing as incomes head higher. And as consumers meet their basic needs, aspirational wants usually follow. This “premiumization” trend could boost demand for high-end items such as luxury cars or for services such as entertainment and wealth management. 1.Source: International Monetary Fund World Economic Outlook January 2018 Update. There is no assurance that any estimate, forecast or projection will be realized. 2.Based on the MSCI Emerging Markets Index versus the MSCI World Index, US dollar terms. The MSCI Emerging Markets Index captures large- and mid-cap representation across 24 emerging-market countries. The MSCI World Index captures large- and mid-cap performance across 23 developed markets. Indexes are unmanaged and one cannot directly invest in them. Past performance is not an indicator or guarantee of future performance. Will 2018 Be a Record Year for US Dividend Increases? Will 2018 be a Banner Year for US Bank Stocks?